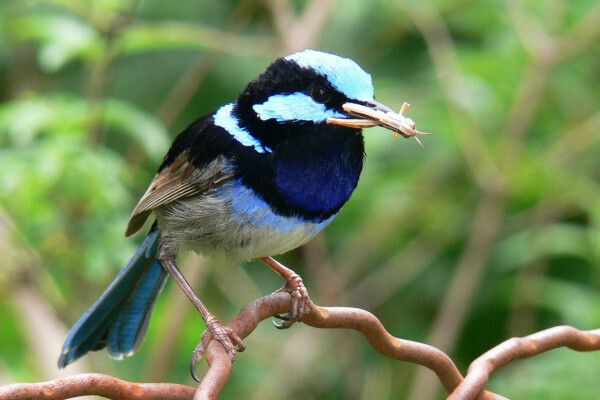 In Fairy-wrens (Malurus cyaneus), hungry chicks need to give a password to get food from their mother, and research published in Current Biology shows that they learn this password while still in the egg. t's important for a Fairy-wren to recognise its own young because they are subject to parasitism by cuckoos - in particular the Horsfield's bronze-cuckoo. Adult cuckoos lay their eggs in fairy-wren nests, and leave the young to be brought up by the wren. A developing cuckoo chick will eventually throw all of the other chicks from the nest, meaning that all of the wren's resources go into bringing up someone else's offspring. This is hugely costly, so the wrens have evolved a range of behavioural and acoustic ways to cope. Sonia Kleindorfer at Flinders University and colleagues in America and Austria monitored 15 nests for the entire nesting period, recording all of the wren songs. They discovered a previously unknown vocalisation, now called the incubation call, which females only used when they were alone and incubating their eggs - stopping as soon as the eggs hatched. They also recorded the young after they hatched, and were particularly interested in the calls made whilst begging for food. Noticing significant differences between different nests, they then compared the begging calls with the incubation calls from the same nest, and found a shared audio "signature" in both types of call. This could indicate that the call is learned while still in the egg, or may be genetically hard-coded into the chicks. To find out, they did a series of foster-parent experiments by swapping complete clutches of eggs into unrelated nests and looking for similarities in vocalisations. They found that the similarities were significantly greater for parents and their foster chicks than for genetically related animals incubated by a different mother, reinforcing the idea that these signatures are learned, rather than inherited. Further evidence comes in the fact that similarity between mother and parent was related to how frequently the mother called during incubation - a dose-dependent response, to use medical terminology. The research didn't entirely rule out a genetic component, as certain elements in the song showed similarities with biologically similar but fostered animals, hinting that genes still play an important role. Playback experiments then confirmed that hearing this password did cause adults to behave differently towards the offspring, and were far more likely to abandon a brood that didn't use this signature in their calls. Females were also recorded calling to males to solicit food, and including the same signature as in their incubation calls. The males also seemed to learn the password, and would adapt their behaviour accordingly by, for example, reducing feeding rate when exposed to calls that didn't match. The researchers argue that, as cuckoo eggs are added to the nest at a later stage than the wren's own eggs, they are therefore exposed to fewer incubation calls, and have less opportunity to learn to mimic the mother. Kleindorfer and colleagues argue that this gives the wrens an advantage against the cuckoos in an acoustical arms race, and help to avoid wasting resources bringing up an unrelated chick.